We might think we know all about Japanese food. It’s sushi, isn’t it? In fact there is a dish that is eaten more often than that aforementioned raw fish and rice, and that is miso soup – and one can enjoy that at almost every meal in Japan, including breakfast. Miso, the central ingredient to the eponymous soup, is a unique product. It is a traditional and much-loved paste made from fermenting soybeans with salt and koji, a variety of enzyme. It is used extensively not only for soup but for sauces, preserving vegetables and also as a glaze for grilled foods such as aubergines. Different styles of miso are made all over Japan but itsu’s miso comes from the Nagano region of Japan, not far from Tokyo. The basic bean preparation is combined with herbs and spices and fermented for three months. It is rich with minerals and vitamins, and celebrated for its health benefits. itsu offers convenient sachets of miso which are gluten-free and vegan. Each sachet has the perfect amount of miso for an instant lunch-time soup. If you prefer a salad then just mix the miso with a little mayo or even sour cream and you have a delicious and savoury salad dressing. Spread a little miso mixed with oil over fish or vegetables before putting them under the grill. A little miso added to the humble mashed potato will transform it. 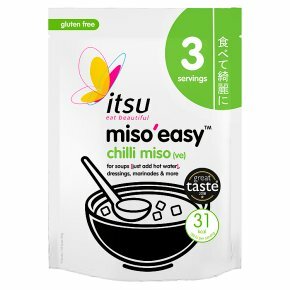 Chilli-flavoured gluten-free miso soup paste from itsu is well worth trying. Yes, add hot water for soup but consider this as a versatile condiment for so many savoury dishes. It’s simple to use and a little goes a long way.